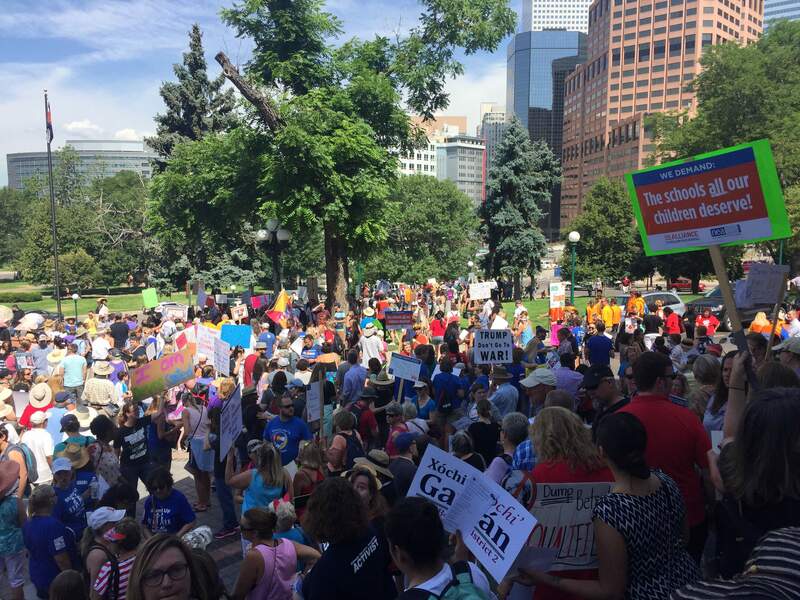 Hundreds of Coloradans assembled at the state Capitol on Wednesday to protest a visit by U.S. Secretary of Education Betsy DeVos. While Devos’ visit to Denver to speak at the annual meeting of a conservative legislative group was the motivation for the protest, it quickly transitioned to a criticism of elected officials who would take funding away from traditional public schools. Wednesday’s protest at the capitol was organized by Denver Public Schools graduate Tay Anderson, 18. Anderson is running for a seat on the DPS Board of Education in November. DENVER – Hundreds of Coloradans protested U.S. Education Secretary Betsy DeVos’ visit in Denver on Wednesday, largely criticizing her stance on using tax dollars to fund private schools. The protest had hallmarks of a Republican versus Democratic showdown, using DeVos’ visit as the catalyst. It quickly went beyond attacks on the secretary of education and the GOP and to attacks on anyone who had promoted efforts to move funds away from traditional public schools. 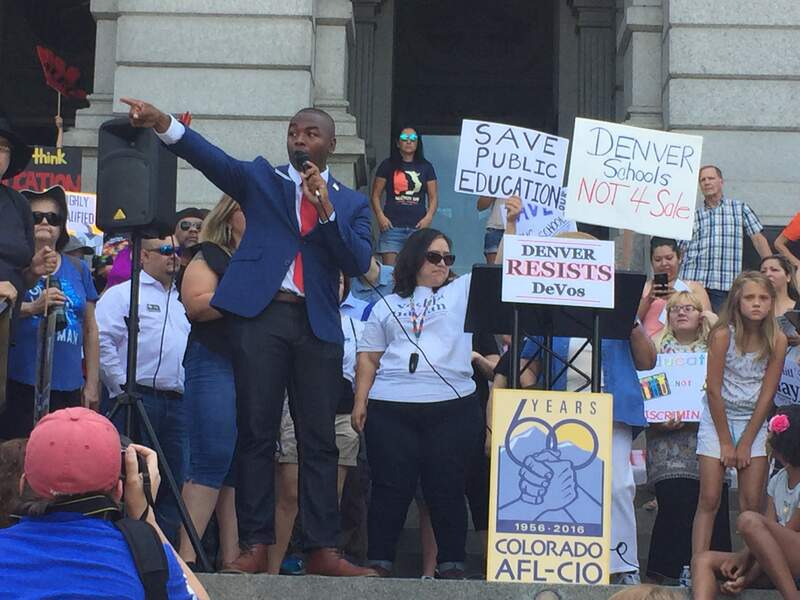 Protesters called out U.S. Sen. Michael Bennet, D-Colorado, who pushed a reform program while he was superintendent of Denver Public Schools, members of boards of education in Denver and Douglas counties and state lawmakers who supported efforts to equalize school funding. Merrifield, a former teacher and member of the Senate Education Committee, also called out fellow Democrats who supported charter schools during the 2017 Legislative session. “Members of my own body, my own caucus have bought into this frightening and destructive attack on our children,” Merrifield said. Rep. Joe Salazar, D-Thornton, said efforts to funnel money from public schools to less regulated charter and private schools are also taking place in the Colorado Legislature, including House Bill 1375, which was passed during the 2017 session. HB 1375 requires Colorado’s 178 school districts to equitably distribute their state and local funding with charter schools by 2019. This distribution includes funds from mill levy overrides passed in 2016 and must amount to 95 percent of the per-pupil funding a student would be allocated if they attended a traditional public school. Merrifield and Salazar opposed HB 1375. “I thought it was a disgusting bill that strips away money from public schools to give to charter schools without any accountability whatsoever, and I’m really pissed off about that,” Salazar said. The complaint of a lack of equal accountability – charter schools are allowed to waive out-of-state requirements for public schools – is a common criticism of HB 1375, as has the accusation that it took away a school district’s ability to decide how to best distribute its money based on the needs of the community. Rep. Lang Sias, R-Arvada and co-sponsor of HB 1375, said claims that the bill undermines local control are mistaken, because ballot measures to raise mill levies do not single out traditional schools over charters and failing to equitably fund them is disingenuous to voters. “Our point is the ultimate form of local control is what the voters voted on,” Sias said. He added that charter schools, while not traditional, are public schools and should be treated as such. “It’s kinda crazy to think a child could move from one public school to another public school in their district ... and somehow that child could be worth a significant amount less,” Sias said. Dan Snowberger, 9-R superintendent, testified in favor of HB 1375 when it made its meteoric run through the Legislature.